Since we are now in the midst of the second round of sessions of the Extraordinary Synod on the Family, our readers might find interesting the traditional order for holding a synod, according to the 1595 Pontifical of Clement VIII. The attentive will have no trouble finding inspiration here for their own prayers for the good outcome of the current assembly. It is divided into three days, and seems to presume that much of the Synod’s business will be determined by the bishop and his assistants beforehand. The rubrics are given here in summary, omitting several of the less pertinent details, such as the places where the bishop removes his miter etc. On the first day, the bishop who has called the synod processes to the church, accompanied by the clergy who are called to the synod “by right or custom”, all in choir dress, and celebrates a Mass of the Holy Spirit. When this is over, a faldstool is placed before the altar in the middle, and the bishop, in red cope and precious miter, accompanied by deacon and subdeacon also in red, kneels before the altar, and intones the following antiphon. “Exáudi nos, * Dómine, quoniam benigna est misericordia tua: secundum multitúdinem miseratiónum tuárum réspice nos, Dómine. – Hear us, o Lord, for kindly is Thy mercy; according to the multitude of Thy tender mercies look upon us, o Lord.” The choir continues the antiphon, followed by the whole of Psalm 68, “Save me o God, for the waters have entered unto my soul”, during which the bishop sits until the psalm is finished and the antiphon repeated. We are here, o Lord, Holy Spirit, we are here, hindered by the enormity of sin, but gathered especially in Thy name; come to us, be here with us, deign to come down upon our hearts. Teach us what we ought to do; show us, where we ought to go; work Thou what we ought to accomplish. Be thou alone the one who prompts and effect our judgments, who alone with God the Father and His Son possess the name of glory. Permit us not to be disturbers of justice, Thou who love righteousness most mightily; that the evil of ignorance may not lead us, that favor may not sway us, that the receiving of gift or person may not corrupt us. But unite us to Thee effectually by the gift of Thy grace alone, that we may be one in Thee, and in no way depart from the truth. And thus, gathered in Thy name, in all things we may hold to justice, ruled by piety, in such wise that in this life our decree agree with Thee entirely, and in the future life, we may obtain eternal rewards, for the sake of what we have done well. All answer “Amen”, and the bishop adds a second prayer. Let us pray. Almighty and everlasting God, who by Thy mercy hast safely gathered us especially in this place, may the Comforter, who procedeth from Thee, enlighten our minds, we beseech Thee; and bring us unto all truth, as Thy Son did promise; and strengthen all in Thy faith and charity; so that, stirred up by this temporal synod, we may profit thereby to the increase of eternal happiness. Through the same our Lord Jesus Christ etc. The bishop then kneels at the faldstool, and all others present also kneel, as the cantors sing the Litany of the Saints. After the invocation, “That Thou may deign to grant eternal rest to all the faithful departed”, the bishop rises, takes his crook in hand, and sings the following invocation; at the place marked, he makes the sign of the Cross over those gathered for the synod . 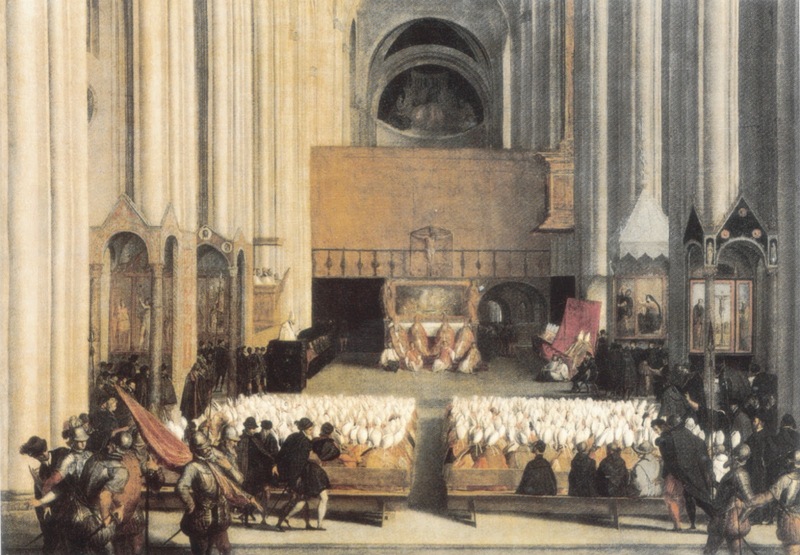 “That Thou may deign to visit, order and + bless this present synod. R. We ask Thee, hear us.” The cantors finish the Litany. All rise, and the bishop sings, “Oremus”, the deacon “Flectamus genua”, and the subdeacon, after a pause, “Levate”, after which the bishop sings this prayer. Grant to Thy Church, we beseech Thee, o merciful God, that gathered in the Holy Spirit, She may merit to serve Thee in sure devotion. Through our Lord Jesus Christ etc. The deacon then sings the following Gospel, (that of the Thursday within the Octave of Pentecost, Luke 9, 1-6,) with the normal ceremonies of a Pontifical Mass. At that time: Calling together the twelve Apostles, Jesus gave them power and authority over all devils, and to cure diseases. And He sent them to preach the kingdom of God, and to heal the sick. And He said to them: Take nothing for your journey; neither staff, nor scrip, nor bread, nor money; neither have two coats. And whatsoever house you shall enter into, abide there, and depart not from thence. And whosoever will not receive you, when ye go out of that city, shake off even the dust of your feet, for a testimony against them. And going out, they went about through the towns, preaching the gospel, and healing everywhere. My venerable fellow priests and dearest brethren, having first prayed to God, it is necessary that each one of you take up the matters upon which we must confer, whether they concern the divine offices, or sacred orders, or even our own mores and the needs of the Church, with charity and kindliness, and accept them, by the help of God, with supreme reverence, and all his might; and that each one may faithfully strive with all devotion to amend the things that need amendment. And if perchance what is said or done displease anyone, without any scruple of contentiousness, let him bring it forth before all; that by the Lord’s mediation, such matter may also come to the best result. And in this way, let strife or discord find no place to undermine justice, nor again the strength and solicitude of our order (i.e. the clerical order) grow lukewarm in seeking the truth. Before or after this address, a “learned and suitable man” delivers a sermon “on ecclesiastical discipline, on the divine mysteries, on the correction of morals among the clergy”, as determined by the bishop. Complaints may then be heard (“querelae, si quae sunt, audiuntur”), presumably in accord with the matters the synod has been called to address. The archdeacon then reads several decrees of the Council of Trent on disciplinary matters pertaining to synods, and the Profession of Faith known as the Creed of Pope Pius IV. Finally, all are “charitably admonished that during the synod, they conduct themselves honestly in all regards, even outside the synod itself, so that their behavior may worthy serve to others as an example. The bishop gives the Pontifical blessing, and all depart.